I’ve just read this book – The Pumpkin Plan. In it, author Mike Michalowicz, reveals how applying the secrets of prize-winning pumpkin farmers to business, can help you to grow your agency to a colossal size too. Just as almost every pumpkin farmer grows ordinary pumpkins, most estate agents grow ordinary, unremarkable businesses. Yet by applying some strategic pruning and nurturing, farmers can grow giant, prize-winning pumpkins that get all the attention and press coverage. That’s the theory, but what’s the practice? Step Three: As the pumpkins grow, remove all the diseased or damaged ones. Step Four:Weed madly. Let nothing survive that isn’t a pumpkin plant. Step Five:Identify the stronger, faster-growing pumpkins. Remove all the less-promising pumpkins. Repeat until you have one pumpkin on each vine. Step Six:Focus all of your attention on the big pumpkin. Nurture it around the clock and guard it fiercely. Step Seven:Watch it grow. Apparently in the last few days of the season, you can actually see this happening, as they have a final growth spurt. Whatever strategy you used to get your agency to the size and success it is now, won’t get you to the next level. You need a new growth-focused strategy to do that. You may be currently spread too thin, wasting energy serving clients who drive you mad and who will never make you rich, and in serving them, you’re taking precious time away from the clients your agency should be working with, and who can make you rich. 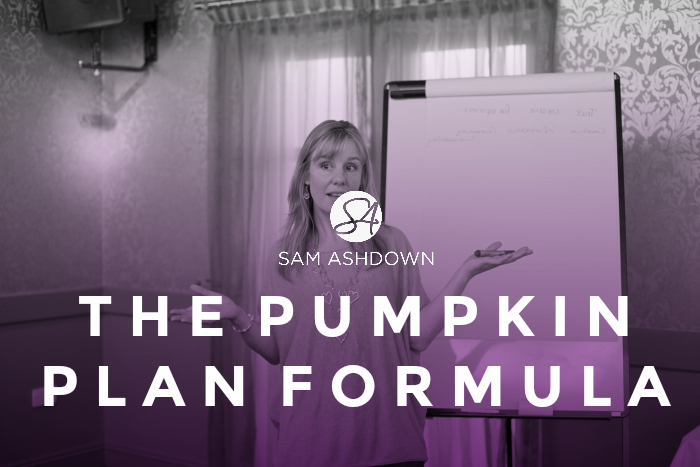 So here’s the Pumpkin Plan Formula in terms that apply to you, to help you grow your agency with the right clients, lose the wrong ones, and make some serious money! Identify and leverage your biggest natural strengths. What are you best at? Where do your skills exceed those of your competitors? Get out of the office and go door-knocking, then call every single name on your database and drum up a heap of market appraisals. As your business grows, fire all of your worst clients. Look at your portfolio and find the deadwood. The overpriced properties, time-consuming clients and those houses that people just don’t seem to want. Ask for a 20% price reduction and if you don’t get it, get rid! Never, ever let distractions take hold. Weed them out – fast. ‘New opportunities’ can be dangerous distractions from your core goal. If you’re always flitting off to the next new shiny object, you won’t achieve your aims. Stay focused and on track. Identify your top clients and remove any clients that are no longer a good fit. Make a list of your VIP clients – the ones with the best houses, a great attitude, and who recognise and appreciate the value of your service. Between these and the weeds you have got rid of, is the body of your listings. You need these properties to move fast, so create a strategy to get them sold in the next 30 days, or these clients too must go. Focus all your attention on your top clients. Nurture and protect them: find out what they want more than anything, and if you can and should, give it to them. Then replicate that same service for as many of the same types of top client as possible. Improve your service for your VIP clients. Make them feel like royalty. Give them surprise bonuses and extras that will delight them. Then ask for referrals. Watch your company grow to a giant size. Rinse and repeat steps 1-6 whenever necessary! We know this, and yet it’s all too tempting to say yes to any piece of business that comes our way. The grotty flat over the chippy; the house with the smelly dog; the client that is never, ever satisfied, even though he’s paying half a percent less than anyone else. It makes much more sense, therefore, to eliminate the weeds, which are taking time, energy and money away from your best business, then identify your VIPs and heap upon them the love, care and attention that they truly deserve. I did this myself last year. Although I love all my clients dearly, I noticed that a disproportionate number of my lower level clients were taking up all my time and energy; time and energy I should have been spending on my best clients. After all, my time and energy are finite, and there was more than one occasion when I dropped the ball, missing an important deadline or forgetting a call, because I was spreading myself too thinly. To remedy this situation, I stopped taking on little pieces of work that didn’t excite me, actively sought work from innovative, inspirational clients, and put my prices up – a lot. Now I have plenty of time to spend on the clients for whom I can make the biggest difference, and who motivate and stimulate me whenever I work with them. Start weeding, nurturing your best clients, and put your prices up. You may just create a prize-winning agency. And if you do, I’ll be the one in the audience at the Estate Agency of the Year Awards next year, cheering like an idiot. Next post Are you suffering from Superhero Syndrome?